The current voice actor for Ash Ketchum in the English dub, Sarah Natochenny, has posted her voice over resume on her website and the first title she lists is the upcoming 11th Pokémon Movie. According to her website the title for the new movie will be "Giratina and the Sky Warrior". There is currently no release date other than 2009 for the dub release. The movie Giratina and the Sky's Bouquet: Shaymin (ギラティナと氷空の花束 シェイミ) as it is called in Japan, is the second Pokémon movie of the Diamond & Pearl movies trilogy, and the eleventh Pokémon movie overall. It premiered in Japan on July 19, 2008. The movie will be released on DVD in Japan on December 19th. The latest episode of Pokémon Sunday, Diamond & Pearl Returns 'Gureggru of the Mysterious Gym' / 'Updating the Rare Idol Guide!' / 'Pokémon WCS Preliminary Report' (ダイヤモンド＆パールリターンズ「なぞのジムのグレッグル！」 「レアアイドル図鑑をつくろう！」 「ポケモンWCS予選レポート」), aired on Sunday in Japan. This weeks Pokémon Revival episode is なぞのジムのグレッグル！ (Gureggru of the Mysterious Gym) which is the eight episode of Diamond & Pearl. Musashi runs a fake Pokemon Gym and is challenged by many opponents. A wild Gureggru follows Nyarth as he goes to get supplies for their gym. What will become of this wild Gureggru and will Satoshi and his friends find out about Rocket Gang's fake gym? In this weeks episode, the Pokemon Sunday gang are back and this time they are working on updating their Rare Idol Guide. The group encounters many different acts as they try to determine which one they like the best. Just months after the last set was released, a new expansion set has been announced for the Pokemon Card Game. Bonds to the End of Time (時の果ての絆) will be released on December 26th, 2008. A DPt Starter Pack - Infernape VS Gallade (ゴウカザルVSエルレイド) will be released at a price of 945 yen. The latest episodes of Pocket Monsters Diamond&Pearl, Naetle, Hayashigame... and Dodaitose! (ナエトル、ハヤシガメ…そしてドダイトス！), aired on October 30th in Japan. Satoshi and his friends encounter Shinji at a Pokemon Center as they watch the Champion Master battle between Shirona and Ryo on the television. Satoshi later practices with his Pokemon and has another Pokemon battle with Shinji. 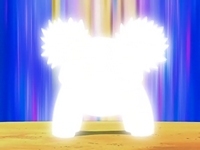 Suddenly, Naetle evolves into Hayashigame!? What will happen next? Pictures from DP100 have been added to the episode guide as well as information on the background music used in this episode. You can can also comment and discuss this episode. Also be sure to rate this and other episodes in the episode guide. The latest Pokémon Diamond and Pearl Box Set, Volume 3 was announced today. 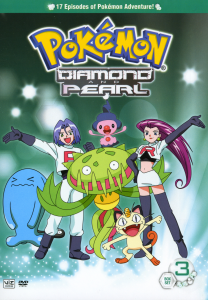 The box set will be released on January 6th, 2009 and will include the rest of the episodes from the Diamond and Pearl series. Ash, Dawn and Brock continue to collect and train new Pokemon on their travels. Along the way they meet up with Pokemon, friends, and trainers as they continue on their journey. Will Ash and Dawn be able to get their next badge and ribbon? The DVD has been added to our DVD Database. There you can view a complete listing of Pokemon DVD's available worldwide. Yuu Mizushima has updated his blog with a picture from the cover of an upcoming script. The episodes title is simply "Riley and Lucario!" (ゲンとルカリオ!) as it's printed on the script book itself. The episode will be the 108th episode of DP and it will most likely air in early January of 2009. Yuu Mizushima will voice Riley. His last role in Pokémon was Doctor Moroboshi from the Izabe Island arc in Advanced Generation. Below is a translation of Yuu Mizushima's blog post. Thanks to Sushi for the translation. "I just came back from recording for a Pokemon guest character. You won't believe it, it's a human character! Not to mention, a handsome one! Lately I've been voicing so many non-human characters that I felt a bit nervous... I'll appear in episode 108 as Gen. Please look forward to it!"